Rich with industrial heritage, the Valleys area of Wales offers Caerphilly Castle, adventure in the Big Pit Mining museum, horse back tours in the Dare Valley, and challenging cycling trails along canal, disused railways and tramways. Black Mountain View is a luxurious cabin, set just a mile from Llanafan Fawr and can sleep two people. 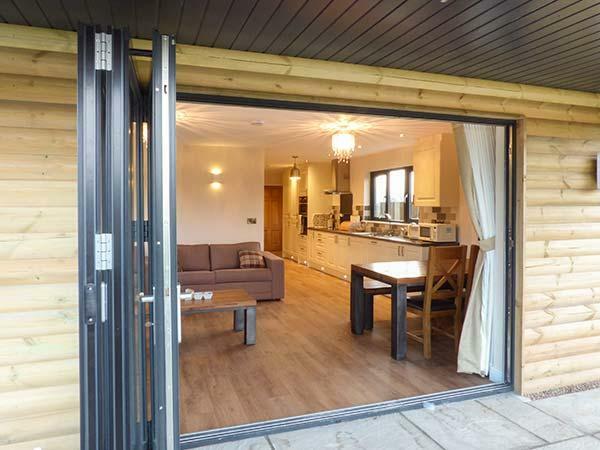 This all ground floor property has a king-size double bedroom with an en-suite shower room, an open plan living area with a kitchen, dining area and sitting area with woodburner and a shared external utility. Outside there is off road parking for two cars, lockable bike storage, stabling for horses (to be pre-arranged with the owner), a veranda with furniture and shared use of the garden with summerhouse, ornamental pond, furniture and a barbecue. 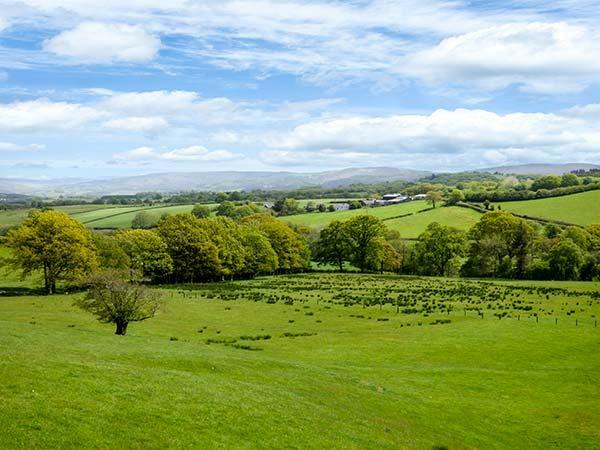 With unspoilt countryside waiting to be discovered, Black Mountain View is a lovely holiday base. Luxurious lodge with one double and one twin (double by arrangement) with ensuite shower. Bathroom with bath and separate shower. Spacious open plan living area with wood burner and patio doors opening onto large decked verandah with outdoor hot tub.. Enjoying an idyllic setting on the edge of Radnor Forest, Lower Fishpools Lodges offer a spacious, stylish retreat for lovers of the great outdoors and peaceful rural seclusion. Stargazing from your hot tub is a must! Stabling* available all year round. *Charges apply.. 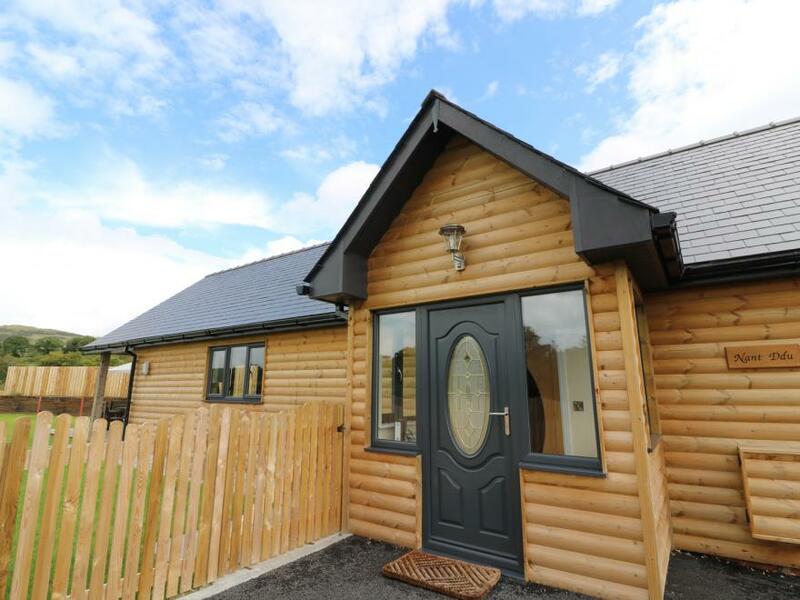 Enjoying an idyllic setting on the edge of Radnor Forest, Lower Fishpools Lodges offer a spacious, stylish retreat for lovers of the great outdoors and peaceful rural seclusion. Stargazing from your hot tub is a must! Stabling* available all year round. *Charges apply. Luxurious lodge with king size double. Bathroom with corner bath and separate shower. Sauna. Perfect for romantic breaks at any time of year. 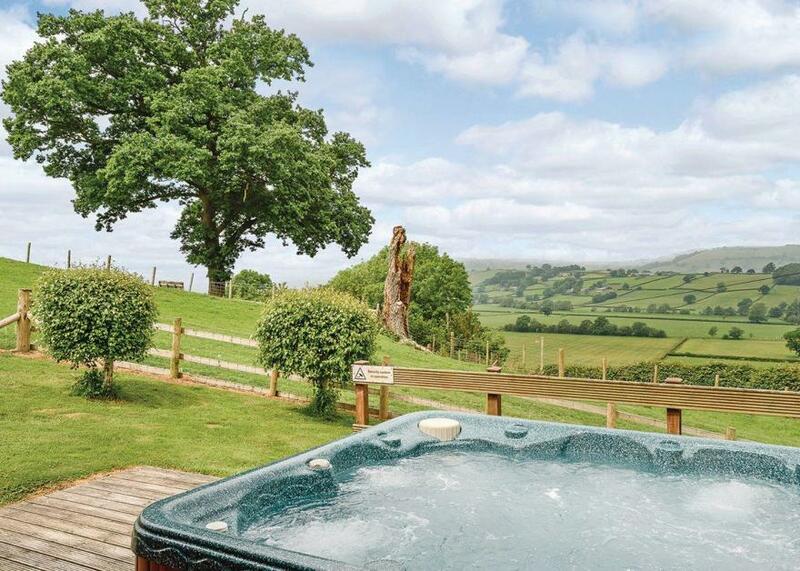 Outdoor hot tub.. Trewythen Lodges is part of our Autograph Lodge Holidays Collection and commands a breathtaking location with spectacular views across the rolling mid Wales countryside. Only two miles from the pretty villages of Caersws and Llandinam, with an array of pubs and shops serving and selling fresh local produce. Each lodge is well appointed and individually styled with every comfort in mind to make the most of the stunning views. Stylish contemporary furniture blends effortlessly with the light timber interiors creating a wonderful retreat from which to enjoy the glorious surroundings. A covered balcony with extending decking area complete with outdoor hot tub makes this perfect for a romantic break or a relaxing escape. You can enjoy a delightful range of body treatments and massages in the comfort of your own lodge (charges apply).. Trewythen Lodges is part of our Autograph Lodge Holidays Collection and commands a breathtaking location with spectacular views across the rolling mid Wales countryside. Only two miles from the pretty villages of Caersws and Llandinam, with an array of pubs and shops serving and selling fresh local produce. Exclusive lodge with one double with ensuite shower and one twin. Bath with overhead shower. Sauna. 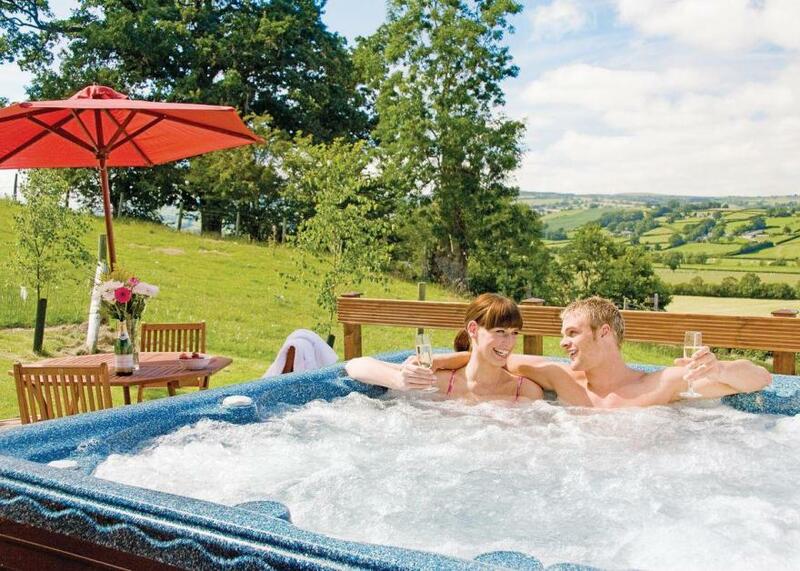 Outdoor hot tub.. Trewythen Lodges is part of our Autograph Lodge Holidays Collection and commands a breathtaking location with spectacular views across the rolling mid Wales countryside. Only two miles from the pretty villages of Caersws and Llandinam, with an array of pubs and shops serving and selling fresh local produce. Stylish lodge with two doubles, one with ensuite shower and one twin with TV and Jack and Jill bathroom with bath with overhead shower. Open plan lounge/kitchen/dining area. Outdoor hot tub. Wonderful countryside views.. Situated in an elevated position boasting spectacular views over the rolling countryside, Valley View Retreats lies just outside the pretty town of Llanidloes, home to the spectacular Clywedog Reservoir and iconic river Severn. The nearby market towns including Llandrindod Wells, Machynlleth, Llanidloes, and Newtown offer good days out and are scattered with numerous gift shops, highly acclaimed restaurants and countless historical sites waiting to be explored including the majestic Powys Castle.. Situated in an elevated position boasting spectacular views over the rolling countryside, Valley View Retreats lies just outside the pretty town of Llanidloes, home to the spectacular Clywedog Reservoir and iconic river Severn. The nearby market towns including Llandrindod Wells, Machynlleth, Llanidloes, and Newtown offer good days out and are scattered with numerous gift shops, highly acclaimed restaurants and countless historical sites waiting to be explored including the majestic Powys Castle. Caban Ceirw is a detached lodge located in the did-Welsh village of Llanbrynmair. It hosts three bedrooms made up of two double rooms (with en-suites) and one twin. The lodge contains an open plan living area complete with a kitchen, dining area and sitting area with an open fire. To the rear of the property sits a decked area with furniture and a barbecue, with a large grassed area beyond it. 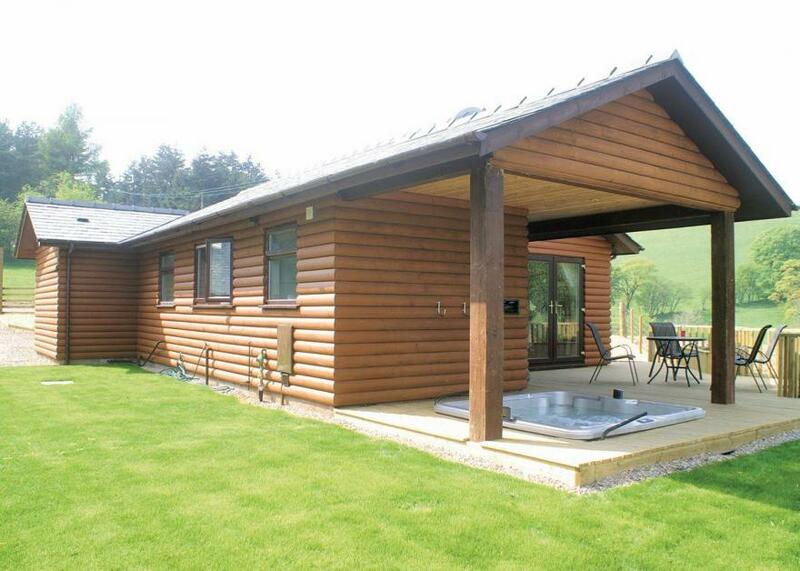 In the heart of beautiful mid-Wales, this lodge is the perfect place for a family and friend holiday. Caban Dulas is a modern lodge, adjacent to the owner's property on the edge of the stunning Cambrian Mountains and 4 miles from Rhayader. It can sleep six people in two bedrooms. There is a king-size double bedroom with an en-suite shower room and a further king-size double that can be made into a twin on request. The lodge also has a family bathroom and an open plan living area with kitchen, dining area and a sitting area with a double sofa bed. Outside there is off road parking for 2 cars and an enclosed garden with hot tub. Caban Dulas is a delightful lodge to retreat to after exploring this wonderful area. Caban Gwdihw is a superb detached holiday home, on the edge of the village of Llanbrynmair, 11 miles from Machynlleth. 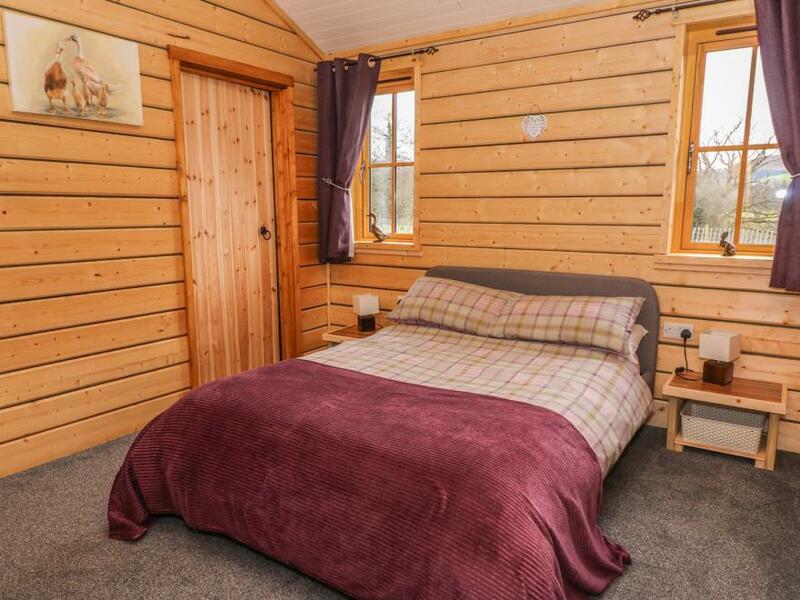 This single-storey log cabin sleeps six people in two en-suite double bedrooms with walk-in wardrobes, and there's a twin bedroom and separate bathroom available. 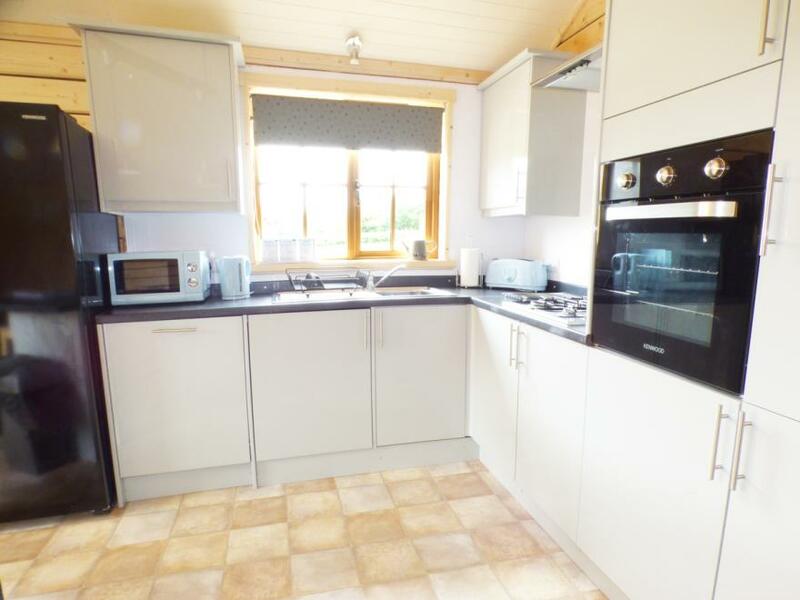 The cabin also has an open plan living area with kitchen, dining area and sitting area with woodburner. Outside there's off road parking for three cars and an enclosed lawned garden with patio, hot tub and furniture. Caban Gwdihw is an excellent base for exploring the area. Caban Hare is a wooden lodge in the Powys village of Llanbrynmair. It comes with three bedrooms including two doubles both with en-suites and a twin room, along with a family bathroom, the property can sleep up to six people. Also inside it incorporates an open-plan living area with a kitchen, a dining area and a sitting area with a woodburning stove. To the outside, find ample off-road parking, lawns, decking with furniture and a hot tub. 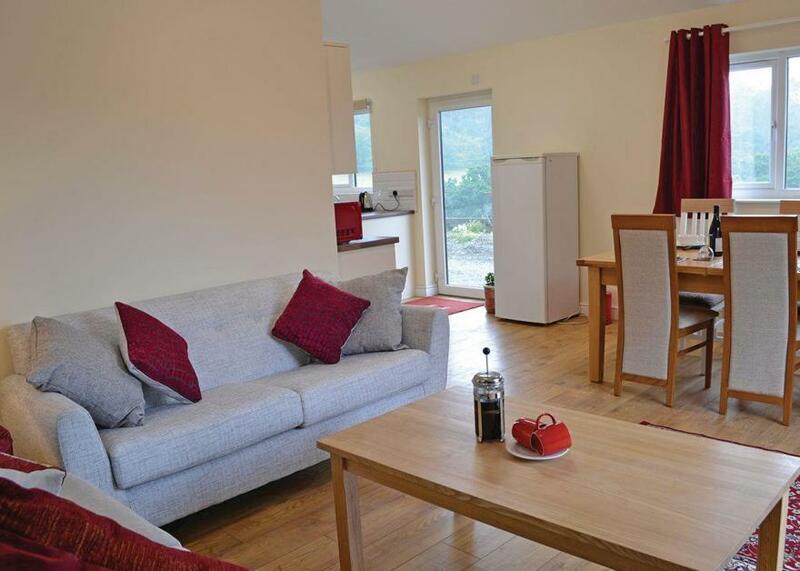 Caban Hare is a homely lodge from where you can enjoy the luscious Mid Wales countryside, as well as the charming town of Machynlleth and the west coast further afield. 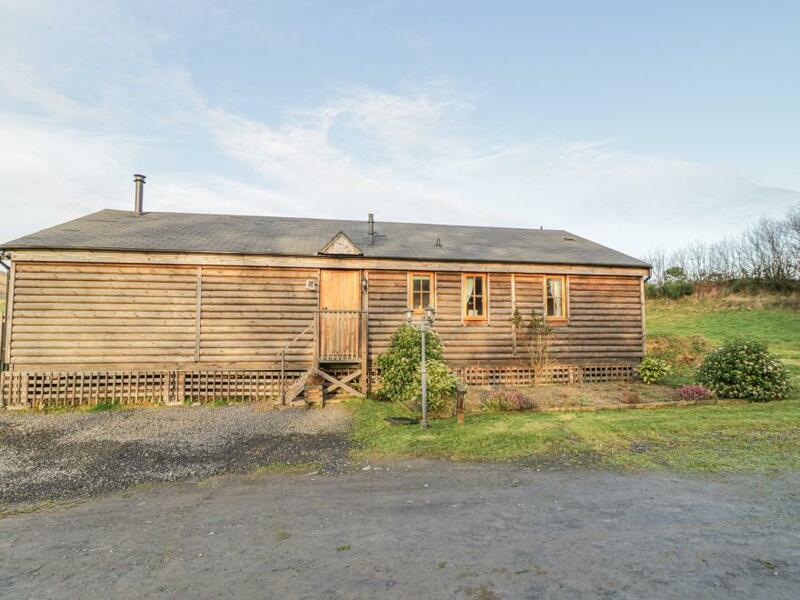 Caban Nant Ddu is a modern ground floor lodge, adjacent to the owner's property on the edge of the stunning Cambrian Mountains and 4 miles from Rhayader. It can sleep four people in two bedrooms. There is a king-size double bedroom with an en-suite shower room and a further king-size double that can be made into a twin on request. The lodge also has a family bathroom and an open plan living area with kitchen, dining area and a sitting area. Outside there is off road parking for 2 cars and an enclosed garden with hot tub. Caban Nant Ddu is set amongst beautiful countryside and is a perfect bolt hole to get away from the hustle and bustle of daily life.